Delhi Mumbai Industrial Corridor, indisputably the largest infrastructure project ever initiated in India, is a revolutionary landmark in the manufacturing sector of the country. Popularly referred to as the 'global manufacturing and trading hub', DMIC is a definitive step towards developing a unique set up that shall industrialize the entire region and give a major thrust to the Indian economy. With the aim to create future-ready industrial cities, the project showcases utilization of next generation technologies and avant-garde infrastructure including green building concept, development of renewable energy, sustainable transport, waste management and water management plants, etc. The project shall be built on Public-Private Partnership model and is estimated to draw an investment of USD 100 billion across its several phases. The government of Japan has played a crucial role in conceptualization of the project and has collaborated with the Indian Government for investing in it and participating actively in its development. In the initial phase, funds to the tune of Rs. 12 billion has been earmarked by the Indian government to develop the trunk infrastructure to kick start the project. An inflow of USD4.5 billion has come as funding from the Japanese government in form of loan which is payable over 40 years at a meagre interest of 0.1%. Balance funding shall be raised through private players who would be keen at investing in the upcoming economic zones. 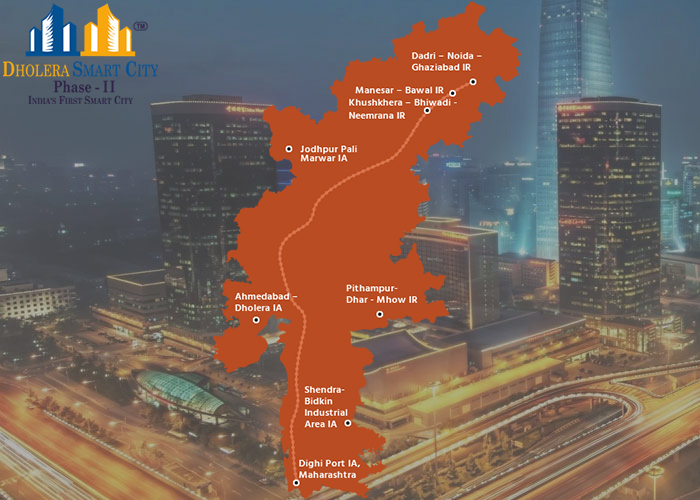 Spanning a commendable distance of 1483 kilomteres from the national capital Delhi to the financial capital Mumbai, the DMIC crosses six states namely Uttar Pradesh, Haryana, Gujarat, Rajasthan, Madhya Pradesh and Maharashtra. Of these, most of the corridor length shall pass through the states of Rajasthan (39%) and Gujarat (38%). The Western Dedicated Freight Corridor (DFC) which spans about 1504 kilometers shall serve as DMIC's backbone and be instrumental in enabling its logistics and transportation viability- elements that a manufacturing hub cannot survive without. The corridors' development shall be promoted and facilitated by Delhi Mumbai Industrial Corridor Development Corporation Ltd. (DMICDC), a special purpose body. Other important projects on DMIC constitute of development of Dholera International Airport and the mega 5,000 MW solar plant in DSIR which shall serve as a great source for renewable energy in the region. The 24 industrial regions planned on DMIC are especially meant to facilitate easy set up of manufacturing plants and promote the 'Make in India' initiative of Indian government. The regions will facilitate establishment of these plants without any issues in the entire process, starting from acquisition of land to resource mobilization, easy transportation through road, rail and port, power and water supply, and easy logistics and supply chain management. Government shall put up favourable norms for these industrial zones and form policies to encourage investors and boost their business potential. With manufacturing at the helm of its development plan, the corridor is projected to create 3 million additional jobs and radically reduce the unemployment issues prevailing in India. The exports are also expected to go up drastically with this project, which will serve as a major impetus to the economy. The projects contribution to India's GDP is estimated at a remarkably 25%. As per sources, DMIC development shall double the employment potential, tripe the country's industrial output and as a result quadruple its exports in a matter of just five years. Thus, economic explosion of a completely different level is anticipated with the onset of this project.